Q: Russian President Vladimir Putin and the DPRK leader Kim Jong-un concluded their face-to-face meeting in Vladivostok today. As far as we know, they mainly discussed ways to resolve the situation on the Korean Peninsula. I wonder if China has any comment about this meeting? Also, President Putin is coming to China for the second Belt and Road Forum for International Cooperation (BRF) and a meeting with President Xi Jinping. Is President Xi going to discuss the Russia-DPRK summit in Vladivostok with him? A: As Russia and the DPRK are both China's friendly neighbors, we are pleased to see stronger high-level exchange and deeper bilateral cooperation between them, which we believe is conducive to the further development of their bilateral relationship and regional peace and stability. We have been following the Russia-DPRK summit. According to the information I have, it has yielded some positive outcomes. We are confident this summit will be a new impetus for resolving the Peninsula issue. I also want to add that as close neighbors of the Korean Peninsula and permanent members of the UN Security Council, China and Russia have all along maintained close communication and coordination on the Peninsula issue. We have made a lot of joint efforts for peace and stability on the Peninsula and explored the formulation of a road map for the political settlement of the issue. The situation on the Peninsula is now showing a positive momentum for dialogue and deescalation. 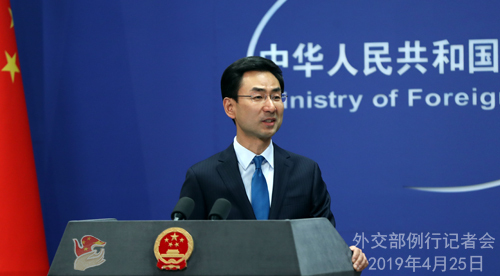 China stands ready to work with all parties, including Russia, to take phased and synchronized steps as part of a package plan, and continue to advance denuclearization and political settlement for more positive outcomes. As for your question on President Putin's meeting with President Xi, we welcome President Putin's participation in the second BRF in Beijing, and President Xi will hold talks with him. More information will be released in due course. You may follow up on that.